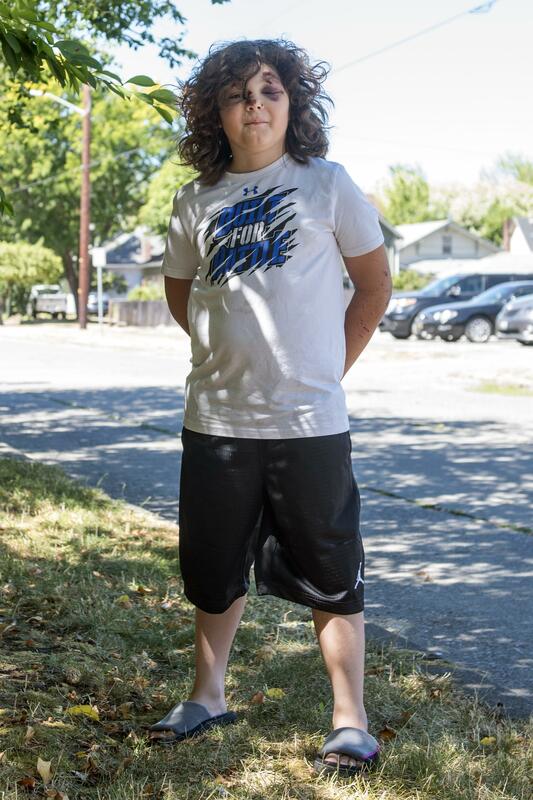 UPDATED: Sun., Aug. 6, 2017, 9:28 p.m.
CENTRALIA, Wash. – Except for some bumps and bruises, a few stitches and a hairline fracture, an Onalaska boy’s life is getting back to normal after being hit by a car while riding his bike in July. Zaiden Cochran, 10, credits a helmet he’d had for only a short time with saving his life and allowing him to recover so quickly from the catastrophic crash. Zaiden was visiting his mother in Marysville when he went for a ride along a familiar route, he told the Chronicle in a recent interview. He was zooming down the street when he came face-to-face with a car. “When I took the left I saw the white car coming and I hesitated,” he said. Neither the car nor the rider was able to avoid the crash. “I felt like a bump and heard it, but I became unconscious,” he said. Zaiden next remembers being on a stretcher with his mother holding on to him. He later learned that his bicycle hit the car with such force that it broke the bumper. The helmet broke the car’s windshield before he was catapulted into the air and over the car. KOMO 4 News reported that police have not cited the driver and do not believe speed was a factor. Despite the force of the crash, Zaiden escaped with no head trauma or serious internal injuries. He has a hairline fracture in his spine that’s expected to heal on its own, a black eye, road rash and a few stitches, but he was more preoccupied during the interview with heading home to play a new video game. The brand new helmet suffered considerably more damage. While some kids might see them as uncool, Zaiden said his experience taught him the importance of wearing a helmet. It’ll be four to six weeks until Zaiden can get back on his bike, due to the fracture, he said, and he’ll miss football this year. “I’m just glad he’s alive,” Cochran said. Published: Aug. 6, 2017, 7:51 p.m. Updated: Aug. 6, 2017, 9:28 p.m.